Bears, sea lions and whales rely on their external blubber to power through hibernations and migrations. For them, a little extra flab is crucial to their survival. Would a Great white shark be so intimidating if it was a little overweight? Probably not. It may instead get the stigma of a cop eating a doughnut with his mouth open. But, like other large megafauna, Great whites migrate thousands of miles across the Pacific ocean without eating much, and their lean physiques have puzzled scientists. Where is the fat to fuel the trip stored? A new study by scientists at Stanford University and the Monterey Bay Aquarium found that instead of storing fat externally, Great white’s instead store the fat in their liver, discounting the previous notion that the sharks would periodically dine throughout the voyage. 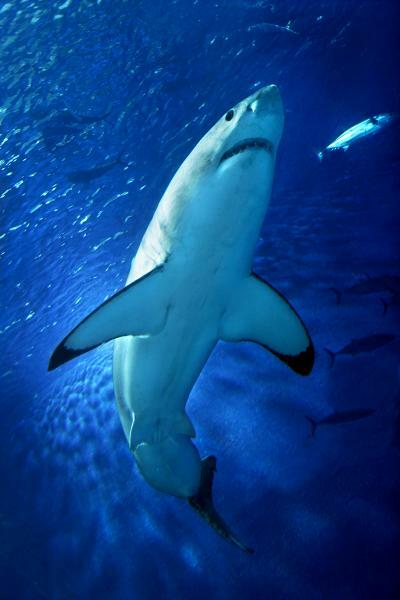 The study also revealed that the fat, which is converted into oil in the liver, affects the buoyancy of the shark. As the sharks gained body mass, they also gained buoyancy and, over the course of their migration their buoyancy slowly decreased. The energy being used to fuel the trip was oil stored in the liver and not gained from quick meals along the way. The authors of the study say that the findings reveal more than just the biology of these creatures. The results show that the meals they eat near shore before their migration is crucial to their survival. They say conservation efforts should include the coastal “buffets”–not only for sharks but also other sea creatures that rely on high calorie meals for migrations.